Ettonez Moi was Penny Byrne's first solo show with her Melbourne gallery Fehily Contemporary. In a vast departure from her most recent solo shows which included up to 20 small scale ceramic works Ettonez Moi (astonish me) featured only two artworks. 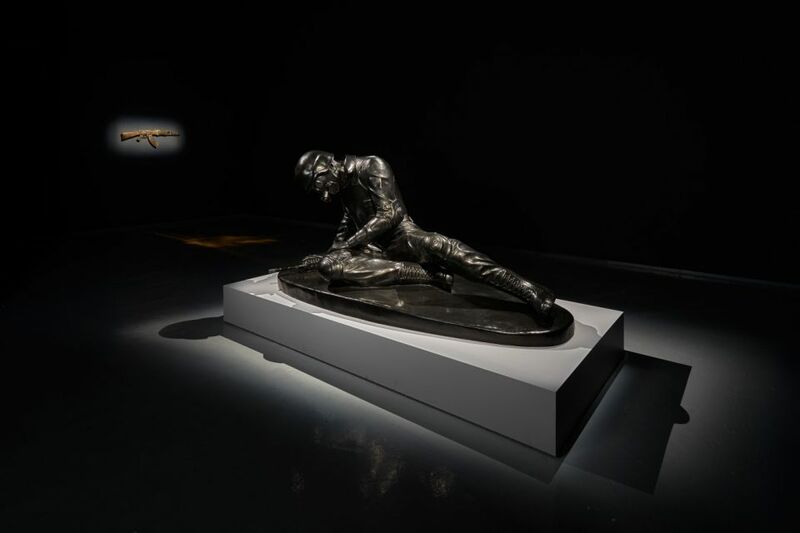 A porcelain life sized gold plated AK47 "Weapon of Mass Destruction" and her hugely ambitious new bronze work "felled" made in collaboration with Urban Art Projects in Shanghai. Byrne created a riot in the gallery as part of the opening night, with the gallery plunged into pitch black, partons were given torches and asked to enter at their own risk. They had to find the work illuminated only by torch light whilst being bombarded with a multi track sound scape of thumping pop music and sounds of riots including police sirens, explosions, helicopters overhead and chanting crowds.